I wanted to share this amazing DIY from Free People with you for two reasons. First, July 4 is right around the corner, and these would be perfect for a firework studded celebration. And, these shorts also take advantage of the summer Americana trend. If you’re headed for a vacation, these awesome shorts would be a perfect take-along. How cool are those shorts? Here’s the best news: you can easily make these shorts yourself, with a few simple tools. You’ll need fabric spray paint, painter’s tape, a stencil (for the star shapes, but you could easily cut one out of wax paper instead of buying one), red and white fabric paint, and spongy fabric paint brushes. 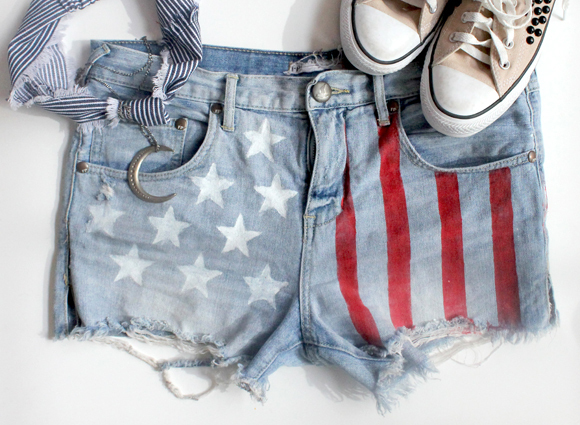 As it stands, I have all of that at home already, and I’ll be making these shorts this weekend! Free People did an excellent job writing clear, step-by-step instructions for this DIY. And, they included great pictures to show you exactly how to do this, so head over to their DIY Page to learn how!